Discount Leotards is your best gymnastics leotard source. In addition to this UnderArmour by GK Elite Sportswear catalog selection, we offer the complete leotard, clothing and accessories collections of GK Elite Sportswear, UA, Under Armour, Adidas, Alpha Factor Aerials, ACE, Snowflake, Motionwear, Dreamlight Activewear, Look-It Activewear, Garland Activewear, and more. We have much more than what we show online! 6334 Consistent Under Armour® by GK Elite ArmourFuse® sublimated subfuse gymnastics leotard with hair scrunchie. 6336 Innovate Under Armour® by GK Elite ArmourFuse® sublimated subfuse racer back gymnastics leotard with hair scrunchie. 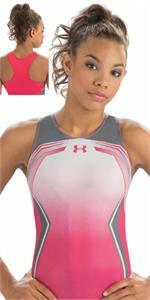 6321 Matrix Under Armour by GK Elite Sportswear sublimated holotek V neck gym leotard. Free scrunchie. 6320 Unity Under Armour by GK Elite Sportswear red mystique, navy techmesh, white opalescence V neck gym leo. Free scrunchie.